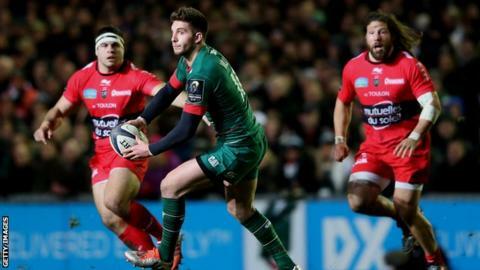 Scarlets coach Wayne Pivac would "definitely" like to have Leicester fly-half Owen Williams back. The 22-year-old left the Welsh region to join the Tigers at the end of the 2012-13 season and has established himself as the first-choice No 10. But Pivac says the Scarlets are keen to explore the possibility of bringing Neath-born Williams back to Wales. "[Recruitment] is an ongoing process and his name is one we're discussing," Pivac said. "We saw him first-hand when we played Leicester and since then his goal-kicking has been outstanding and his general play has been pretty good. So he's a good, young talent. "It's something behind the scenes we're working on all the time, in terms of the make-up of next year's squad. "We're going through this year's squad, who's coming off contract and looking at who we're retaining and who we're replacing." Williams was preferred to the departing England fly-half Toby Flood last season by Leicester, and has remained the man in possession despite the Tigers recruiting Freddie Burns from Gloucester. It is unlikely that Leicester director of rugby Richard Cockerill would let one of his crown jewels depart without a struggle, especially after Williams led them to a fine European Champions Cup win over Toulon last weekend. The Wales Under-20 fly-half had been tipped to win his first senior Wales cap last June on the tour to South Africa, but a suspension prevented Williams from being named in the squad. Wales fly-half Rhys Priestland and Steve Shingler are the senior stand-offs at Parc y Scarlets. The Scarlets lost 24-9 at Ulster in the European Champions Cup last weekend and realistically have to win their final three matches to qualify for the knock-out stage. The Welsh region has injury concerns over Wales full-back Liam Williams and flanker James Davies for the return pool game with Ulster on Sunday.